After decade-long obsession to ‘towerism’ as a result of oversimplified internationalism, Chinese architects finally begin to realize the need of making positive response to the global trend by returning to the topographic uniqueness of the site that are treated a basis for the designing. In fact, this is a necessary step for the creation of unique identity that can vitalize the site. Accordingly in this particular practice, we have found that the relation between the mountains and the sea need to be further emphasized and clarified, which includes not only ecological elements such as water, wind and plants, but also includes visual experiences, as well as behavioral experiences in various speed ranges. 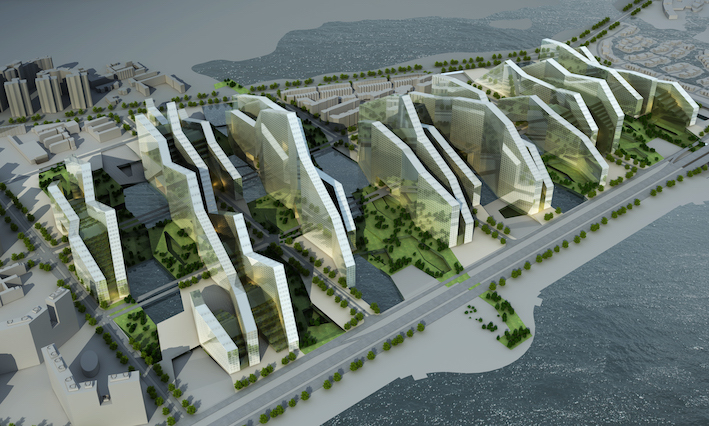 Out of this consideration, we let the buildings interwoven with a pedestrian system running perpendicular to the city highway to the north, providing for an idea passageway between the mountain and the sea. The process of ‘new urbanization’ in contemporary China is undergoing a transition from CBD of earlier times to a new form of RBD. In the due course, we are also experiencing a transition from the traditional centralized zoning system to the more scattered and flattened system in the digital era. The tendency of decentralization has made towers and skyscrapers obsolete. On the other hand, the development of big data and the various internet-based applications based upon it have fundamentally changed the idea of service groups. (In fact, the largest service groups are those serving the service sector itself.) It promotes the idea of sharing and provides the possibility of a more efficient management. The new working community in the future will put more emphasis on industrial network based on compliment between multiple functions (which is formed by the intersections of various industry chain in traditional sense). These new working communities are called creative organisms. In other words, they are symbiotic service networks that straddles both the virtual world and the actual world. In a creative organism, all the enterprises will benefit from a large varieties of shared services from inside. The buildings embrace both the water systems and plants to form an Eco Trunk (including flood discharge, rivers, as well as greeneries, pedestrian and bicycle ways upon them). Several secondary eco networks branch from the trunk and grow upwards along the ‘service cloud space’ inside the buildings and finally reach the terraces on the top floor, where the they finally finish the transition from the egoistic ‘towerism’ to the 3D ‘eco network’ that penetrates all the spaces on the upper floors. In exactly the same place, the idea of gardenized architecture sublimates into a gardenized 3-dimensional city. Looked afar either from the Shekou Costom House, or from downtown Shenzhen, the extraordinary view of layers of ‘architectural mountains’ will doubtlessly impress the spectator with an superimposed image that looks partly futuristic and partly traditional. To some remote extent, the data and the clouds projected on the surface of the futuristic Digimount is just like our mind: sometimes it is occupied by mounts of data, while sometimes it would be as tranquil as the clouds on the sky.